Gleaning data from preferences and purchases. From writing a business plan to developing and offering products and services, small business face the same hurdles as large corporations. Where are the opportunities? Who are the potential customers and what do they need and/or want? Bottom line: What will sell? Large companies spend a great deal of time and money identifying their market as it is key to strategy and to profitability. Small business owners need the same information, but gathering it is a slower and less structured process. No outsourcing, no big data to crunch. Pricing is important, but understanding potential buyers comes first. Who are they? What interests them? What will appeal to them? And perhaps most importantly, where are the opportunities? Two fiber festivals. Two markets. Among others, Winter's Past Farm is a regular exhibitor at Garden State Sheep and Fiber Festival, a weekend event in mid-Jersey, and Kings County Fiber Festival, a Saturday event on Columbus Day weekend in Brooklyn. I'm focusing on these two here. Although only about 50 miles apart the two festivals are very different. Type of festival: Hosted by Garden State Sheepbreeders, the event features a two-day sheep and fiber livestock show. A community event that also draws serious fiber folks from an estimated 40 mile range in central New Jersey. Date: Second weekend in September. Location: Set amidst farmlands in a county agricultural fairground's dim and dusty barns. Weather: The 2014 weekend was brutally hot vs. this year, which was beautiful. The crowd seemed smaller this year, but once tallied, sales figures were the same year over year. Type of festival: Street festival. Lots of families, but far fewer serious fiber folks. Date: Saturday of Columbus Day weekend. Weather: Comparing year over year, we noted that about half the 2014 vendors bailed out due to heavy rain. However, once the rain cleared, there was a flood of customers and business was brisk. This year, it was a spectacular fall day and all vendors showed up. It certainly seemed that there were fewer customers. Did more people travel over the beautiful long weekend? As we pondered differences, we also noted different purchasing preferences, both year over year and between the two festivals. 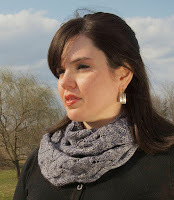 For me, the most dramatic difference was the preference between two knit accessories. 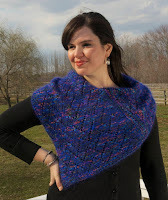 I had taken two recently released patterns--The Peacock's Gift, a singular shawl in striking royal blue (below, left), and Jersey Waterways, a versatile cowl in a lightly variegated gray (below, right). At Garden State, the Peacock's Gift was the clear attention-getter and the sole source of pattern revenue. There was little interest in Jersey Waterways. Was it color? The weather--surely a factor but how important? And what about the demographics? I'll probably never know the answers--and there is nothing to suggest that things won't change next year. But I'm reassured that knitters like what I'm doing, so I'll just keep designing what I like--and listening and watching for reactions. Going to the festivals like this it is a great idea as you can have so much fun on these festivals with gathering the knowledge as well. Last week I have been to an event at Chicago venues and it was a great experience.